Everyone that we worked with was very kind and helpful! The condo was perfect for our family. Great location and very clean! The front desk was very knowledgeable. We were able to check in early which was great and Shakyra was very confident and delivered information clearly and concisely. Beautiful condo that was well stocked. There were beach towels, chairs, toys and even a cooler to use. Very quiet property. A great place to come and relax. Your team is great, they were very nice. I enjoyed the stay, it is beautiful. I like that Navarre is such a laid back area with easy access to Destin and Pensacola. Makes a perfect vacation area. It was an amazing time...would love to come back for a longer stay. 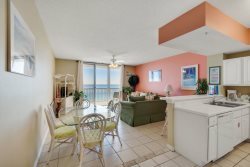 Outstanding beachfront condo overlooking the beautiful blue water of the Gulf of Mexico. Ideal location, sugar sand beaches! !